The tangled remnants of treasures revealed. As a creator, I’ve learned a lot about destroying. In order to create, we must destroy. It is a part of the creation process. Destroying makes the space for new creation. We destroy a hank of beads so that we may order its pieces into a necklace. We destroy old ideas to make way for new. We destroy empty space to fill it with a new painting. We destroy a design that doesn’t work in order to create a new one that, hopefully, works. I was faced with this last dilemma recently. Off and on, for the past 8 months I’ve been working on an intricate piece. I’d made prototypes out of rope that indicated that my idea would work and I was so excited. However, to see if it actually worked, I had to weave it together. After 60+ hours I realized that what I had created would not work like the vision I had in my mind’s eye. So I had to rip it apart. Did I mention it was 60+ hours of work over 8 months time? I’ve come to realize that destroying is as much a part of creating as the act of creation. I used to resent having to destroy my failed beadwork, regarding those precious hours spent making it as squandered and meaningless because they lead to failure. I saw it as a waste of time. As I’ve matured, I realize that time is only wasted if I refuse to learn from the errors I filled it with. When possible I save my beaded failures to refer back to what made them fail. In this case, I’d woven together a costly amount of beads that I needed to un-weave so I could use them. I spent hours pulling apart lovingly crafted rows of weaving. For the first time in my 20+ years of beading, the destruction process fascinated rather than frustrated me. I felt I was watching portions of my life in rewind. As I unravelled, I relived the hours spent weaving while watching a Frank Zappa concert DVD with my husband. Then came memories of my trip to San Diego as I tore out loops made during the summer. Backwards I wove through the section of rows completed in July when we lost our Greyhound. Then the part I’d made during the last weeks of our Dalmatian’s life in March. I deconstructed the parts that I’d shared over lunch with two bead artist friends at a French restaurant. 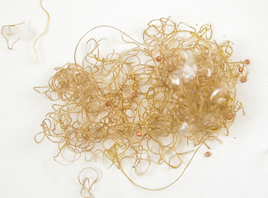 And finally, the very first rows I’d made (while my head spun with excitement) became shreds of thread and loose homeless beads. As I ripped, cut, and pulled, I experienced – in the most tactile way – my methods of ensuring my work for posterity. I also cursed them. Overkill here and there, as I sawed apart six and seven passes of thread through one bead. From this destruction emerged not only the space for my revised design, but also (and this came as a surprise) a more compassionate view of myself. Unwinding months of my life captured in thread and glass offered me a broader perspective of myself. As if watching a film, I saw a woman – in between the mundane and sublime moments of her life, the peaks and valleys, the joys and losses – quietly, methodically building something of beauty. Small and striking. Maybe not a masterpiece, but a creation that would mean something to her, and hopefully to others. I saw someone wanting, from the depth of her heart, to create beauty: beauty that will last and adorn and inspire others to create more beauty. Each fragment of thread and released bead illuminated that part of me that thrives on inspiring beauty, creativity, and excellence in the world. It was an enlightening time of destruction. And at the end of it I felt wiser, more confident, and more excited about rebuilding my vision in a new way. Not a moment has been wasted. I am fascinated by what you just wrote. There is a great deal of learning to be had from our mistakes. I also love it when the idea that I had in my minds’ eye is vastly different from what actually transpires. It is hard to let go of that vision for something better to evolve. This was very insightful and I plan to revisit your post again to really revel in the simple truths that you have culled along with your pile o’ strings. Thank you, Joy. Yes… never waste a bead! Or a mistake!